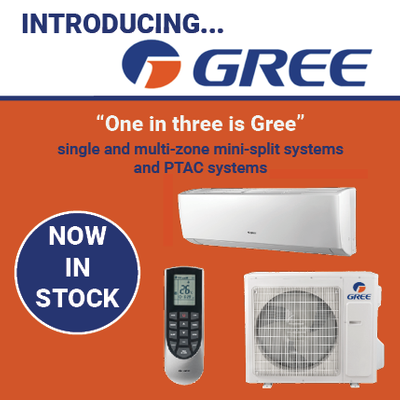 Supply New England is proud to announce that we will now be distributing the Gree Comfort product line of single and multi-zone mini-split systems and PTAC systems. Gree is one of the largest manufacturers of ductless HVAC systems and components in the world. In fact, one in every three systems installed in the world is made by Gree. As the largest manufacturer of air conditioning equipment in the world, Gree embraces research and development, allowing Gree to stay on the cutting edge of technology, energy efficiency and quality. With advancing technology every manufacturer must update models and offerings to stay relevant. One of the deciding factors for the Supply New England team in choosing to partner with Gree is the fact that Gree’s equipment is guaranteed to be backwards compatible as changes are made. This allows Supply New England and our customers to make simple choices and greater inventory availability. As a Gree installer, you will now be able to offer your customers equipment with a wide range of benefits including low heat options down to -22°, Wi-Fi options and a warranty that offers full unit replacement among many other exciting advantages. Gree is a worldwide manufacturer and a Forbes Global 500 company with annual sales of over $16 billion. Reach out to your Supply New England sales team and get all the information on how you can be a leader in the industry and install Gree mini-splits.